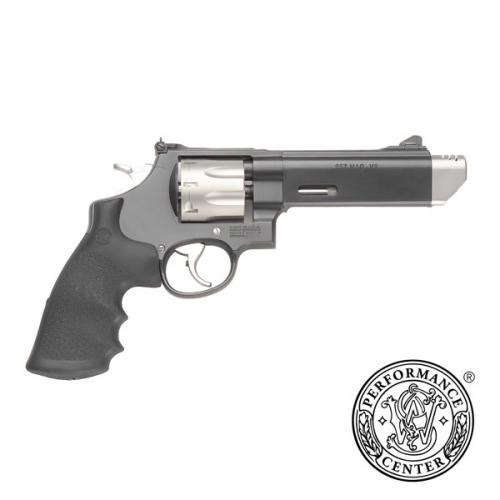 Performance Center guns originate from standard designs or are created from the ground up. From hand-cutting and fitting to fine tuning for precision, these firearms are top performers. Products from the Performance Center are the ultimate expression of old-world craftsmanship blended with modern technology. Features • Chrome Hammer • Chrome Trigger with Trigger Stop • Removable Barrel Compensator • PC Tuned Action • Cylinder Cut For Moon Clips (Moon Clips Included) A moon clip is a ring-shaped or star-shaped piece of metal designed to hold multiple cartridges together as a unit for simultaneous insertion and extraction from a revolver cylinder.